It is probably fair to suggest that Margaret Tudor, the eldest daughter of Henry VII and Elizabeth of York, is the lesser known of his four surviving children, yet it is her descendants, and not those of her siblings, that currently sit on the British throne 477 years after her death, an astonishing achievement. Everyone knows Henry VIII, Margaret’s little brother, with increasing attention paid in recent years to her other siblings Arthur and Mary, but the Tudor who became a queen of Scotland remains somewhat unexplored, until now. The sub-title of this very book is perhaps telling when one thinks of Margaret Tudor – “The Life of King Henry VIIIs Sister”, but fortunately Sarah-Beth Watkins valiantly attempts to remove her subject from her brother’s considerable shadow, something in which she succeeds. Born in 1489 and named for her maternal grandmother Margaret Beaufort, our Margaret was the second child of Henry VII and Elizabeth of York, inheriting blood from both sides of the Wars of the Roses divide and ensuring she would be a highly-sought after princess on the competitive bridal market. It was the Scottish with whom she was eventually matched, and in 1503 at the age of just 13 travelled north to marry James IV, shortly after the death of her mother and eldest brother Arthur, which must have been emotionally taxing for the young girl. Life as queen, however, would be no plain sailing. Margaret was very much a typical Tudor, and exhibited as much determination, stubbornness and questionable judgement as any of her more-famous relations, particularly after her royal husband’s death fighting against her brother in 1513, a period which must have caused considerable anxiety to the queen of Scots. Throughout her life, Margaret’s two loyalties were torn between both her families (and therefore her countries), Tudor and Stewart, and after she made the disastrous decision to remarry to Archibald Douglas, 6th Earl of Angus, political opinion against her prompted a brief return home to the English court of her brother in London. By 1524, however, Margaret had bravely returned to Scotland and even engineered a coup to reclaim power on behalf of her underage son James V in a manner befitting one of Tudor bearing. Not dissimilar to her brother, however, Margaret’s personal life obscured any political ambition, and she petitioned the Pope for a divorce, incurring the wrath of Henry VIII who himself would ironically follow suit just a few years later. She married for the third time to Henry Stewart, before falling out of favour in Scottish politics and passing away in 1541. Her legacy as queen of Scots and an English princess endures however; upon the failure of her brother’s line after the death of Elizabeth I in 1603, it was Margaret’s great-grandson James VI of Scotland who inherited the Tudor crown, ushering in the Stuart period of kings of England. Margaret Tudor’s tumultuous life, therefore, was without doubt a dramatic period in this island’s history, one of far greater significance than either she or her contemporaries perhaps anticipated. At only 168 pages, Watkins’ chronological biography cannot be anything other than a brief exploration of these life and times, but that is not necessarily a negative mark against the author’s work – it covers all the key moments aforementioned, allowing the reader to assume their own extracurricular research on a particular aspect if so inclined. Perhaps because of the length of the book, the narrative is concise, fast-paced and unrelenting, creating an engrossing and well-written account that the reader will race through in no time, whether expert or beginner. The inclusion of primary sourced material, in particular letters written by the subject herself, were also a pleasing addition, somewhat humanising a woman who lived 500 years ago. I was particularly captivated by her varying relationship with Henry VIII, as explored through her own words. In 1517, for example, we have Margaret writing to Henry where she beseeched ‘your grace to continue good and kind brother to me, as you have ever been’ whilst by 1524 the tone had altered somwhat, Margaret chastening her brother for his meddling in Scottish affairs by saying ‘it is right unkindly that your grace hath done this to me your sister’. Siblings, huh? 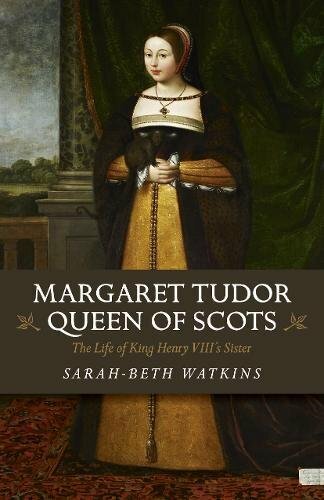 Overall, Margaret Tudor, Queen of Scots; The Life of Henry VIII’s Sister is a worthwhile read that hopefully goes someway to bringing Margaret , the true conduit of her father’ legacy as Watkins’ explores in her final chapter, firmly out of the shadow of her ubiquitous little brother. Sarah-Beth Watkins grew up in Richmond, Surrey and began soaking up history from an early age. Her love of writing has seen her articles published in various publications over the past twenty years. Her history works are Ireland’s Suffragettes, Lady Katherine Knollys: The Unacknowledged Daughter of King Henry VIII, The Tudor Brandons, Catherine of Braganza, Margaret Tudor, Queen of Scots: The Life of King Henry VIII’s Sister and the forthcoming Anne of Cleves: Henry VIII’s Unwanted Wife.